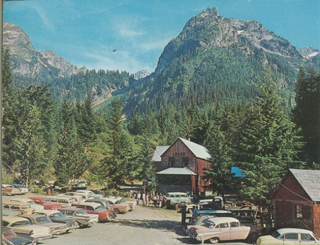 During the summer of 1970 when I lived at the Monte Cristo mining lodge in the Cascades, I kept wandering into the heat of the kitchen to cook up burgers for hikers and omelettes for overnight guests. I was not supposed to be there, working in the kitchen. I was supposed to be on the trails, taking photographs of plants and animals to illustrate hiker’s brochures. But I was crazy about cooking. I grilled sandwiches featuring a double threat of classic cheddar, and then piled on crisp bacon, tomato slices, and grilled onions. Mouthwatering, meltingly delicious cheesiness between two pieces of buttered and grilled bread. The impact of my summer-as-short-order-cook was an eye opener: cooking connected me to strangers. If I had to trace back and think about why I cooked, it was because customers would turn themselves inside out, tell me war stories from a recent tour in Vietnam or the frightening trials they endured while climbing Mt. Rainier. Truths that most of us would never have to face. I fed them and they talked. Stumbling upon the enjoyment of writing about food came later. Project by project, it’s usually hard to say who you are as a writer or what your long-term subject is. But with hindsight you start to see threads. By my tenth newspaper or magazine feature I realized that I was always gravitating back to food. Call me a food-fanatic, but my curiosity and enjoyment of food has now become a writerly obsession.